KIMN wasn't without competition. 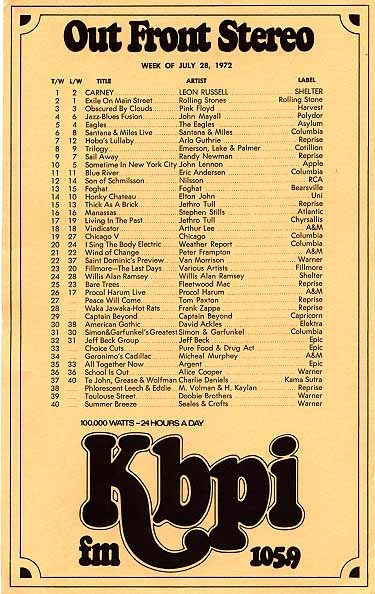 Here are other stations that rock & rolled through the 60's and 70's. If you have information, pictures, airchecks or corrections on any of the following stations, please let us know. We'd be happy to expand this section to pay tribute to every rock and roll station of every style from the era of the sixties and seventies. KBTR now has its own tribute site. Click Here to visit the "All Americans"! KFML now has its own tribute site. Click Here to visit Denvers' premier "Underground" station! KDKO now has its own tribute site. Click Here to visit the ALL NEW tribute to Denvers SoulStation! KTLK now has its own tribute site. Click Here to visit K-TALK 1280! KLZ-FM now has its own tribute site. Click Here to visit Denvers first FM Hits station! 1490 in Boulder. An early Top 40 in the Metro. Alumni includes Johnny Williams, both a future KIMN DJ and one of the original KHJ Boss Jocks. A 50,000 watt daytimer "The Kat". Little known other than it passed on one night in it's sleep. Denvers first Oldies station in the early 70's, with Uncle Mike McCuen in the morning, Russ "Weird Beard" Knight in the afternoon and Tom Shannon on PM drive. Still on the air, having changed formats a few times, including "Heavy metal"(on the AM!!!) became "Christian" for a few years and in late 1999 switched to "Nostalgia". Arvada, a major KIMN competitor for "Top 40" in the early 60's, settled in as a new MOR "KQXI" after the '65 flood knocked them off the air. 105.9 "Rocks the Rockies" was their motto then, and still is now. In mid 70's from their Morrison Road facility they virtually ruled FM rock and regularly sat at or near the top of the ratings. Jocks tended toward the hip sounding laid back delivery, but music was largely mainstream album rock. Worked from a rotation list that allowed for a lot of DJ flexibility, while making sure that a heavy rotation was still followed on the hits. Before it's Rock days of the 70's, was Denvers FM "Soul" station during the sixties. Now located at 106.7 on the dial. 105.9 is now home to KALC "Alice".